Includes among others, Corben (Sindbad), Moebius (Airtight Garage), Druillet (Gail), Morrow (Orion), Petillon (Mission On Saturn), Caza (Planet of Terror). Condition is fine minus (FN-: long dog-ear crease bottom right corner). Heavy Metal Magazine July 1982. Corben, Moebius, Bilal, Schuiten, Druillet. FN-. The gallery is an excerpt from Richard Corben's "Flights Into Fantasy", also Corben's Den2, Bilal (The Voyage of Those Forgotten), Druillet (Yraegal), Peter Kuper, Moebius/Jodorowsky Incal, Schuiten (At the Middle of Cymbiola), and more. Heavy Metal Special War Machine. Dave Gibbons, Simon Bisley story & cover..
(It includes Dave Gibbons'War Machine Rogue Trooper, and Simon Bisley's Max Carnage (Bisley cover is fold-out spread). Low grade copy)). Very Good (VG) (3.5 to 5.4). The original gloss is now gone, and there may be minor writing such as newsagents make, or other discolorations. Heavy Metal November 1994. Bisley cover. (In colour, square bound magazine. Similar back cover top corner.). Comics for mature readers plus an interview with Neil Gaiman. In colour, square bound magazine. This is a new book. Liberatore (and cover as well), Royo, Caza, Enki Bilal and others. Copy in very fine condition (VFN). In general it is a nice comic. A comic, paperback, or hardcover that has been read but looked after will often be in this grading and it is in my opinion a very collectable grade. This copy is in fine condition (FN: small crease top edge. see pic. Old price sticker.). Fine (FN) (5.5 to 7.4). Certainly no writing on the cover or tape repair, but there may be more stress creases and one or two minor, short creases. Includes among others, Corben (Arabian Nights), Barbarella, Moebius (Airtight Garage), Sire (Report V1). Voss (Heilman). Condition is very fine (VFN). In general it is a nice comic. A comic, paperback, or hardcover that has been read but looked after will often be in this grading and it is in my opinion a very collectable grade. Heavy Metal June 1979: Corben, Wruightson & McKie, Bettie Page . Includes among others, Corben (Sindbad), Wrightson and McKie. Betty Page with a monster back cover painting by Marcus Boas. Condition is very fine minus (FN-: has a tape tear top right where a price sticker was removed. ). Silveracre has been dealing in the very finest comics and collectibles since 1988. Don't worry, we will always get to you! Add us to yourfavourites list. WHY BUY FROM US?. The condition of the item you will receive is in the header. Heavy Metal July 1996. Simon Bisley, Azpiri. VFN. Comics for mature readers. Includes among others BISLEY Gallery 'Bodycount', AZPIRI 'Look No Longer To The Stars'. In colour, square bound magazine. Condition very fine (VFN). In general it is a nice comic. Heavy Metal One Step Beyond . Corben . Wrightson. VFN-..
Special Editions vol 10 # 1, 1996. Square bound magazine in very fine minus condition (VFN-: has two old stickers). In general it is a nice comic. A comic, paperback, or hardcover that has been read but looked after will often be in this grading and it is in my opinion a very collectable grade. Heavy Metal February 1978: Corben, Moebius, Barbarella, Sire, Druillet. VFN. Includes among others Corben (Den), Moebius (Free Fall and The Garage and Marvels of the Universe), Sire (Diabolical Planet), Druillet (URM), Barbarella. Very fine copy (vfn ). In general it is a nice comic. Heavy Metal July 1979. Corben, Sire, Moebius, Bode, Adams. VFN. Includes among others, Corben (Arabian Nights), Moebius (The Garage), Sire (The Great Trap), Gray Morrow (Stingaree, Eight Belles), Neal Adams (Rears Its Ugly Green Head), Vaughn Bode (Zooks). A great issue. Heavy Metal March 1984. Moebius, Druillet, Charles Burns, Crepax, VFN. Book is in very fine condition (VFN). In general it is a nice comic. A comic, paperback, or hardcover that has been read but looked after will often be in this grading and it is in my opinion a very collectable grade. Don't worry, we will always get to you! Silveracre has been dealing in the very finest comics and collectibles since 1988. It will normally be fine if we are notified in advance. Heavy Metal June 1983: Corben, Crepax, Kaluta., Captain Beefheart. VFN. C0rben "Doomscult", M W Kaluta "Starstruck", Caza, Crepax, Jeff Jones, and others. Captain Beefheart interview. Condition is very fine (VFN). In general it is a nice comic. A comic, paperback, or hardcover that has been read but looked after will often be in this grading and it is in my opinion a very collectable grade. Heavy Metal November 1999. Caza, Gimenez, Casini.. VFN. Square bound magazine. Condition is very fine (VFN). In general it is a nice comic. A comic, paperback, or hardcover that has been read but looked after will often be in this grading and it is in my opinion a very collectable grade. Heavy Metal November 1983. Crepax, Liberatore, Jodorowsky. Eisner. This copy is in fine condition (FN: a bit weak at the staples). Mint (M) (9.8 to 10) The comic is printed perfectly, with no faults and perfectly centred. The cover has all its original gloss (if applicable): there are no signs of wear or aging (including white of pages), and the corners are sharp. 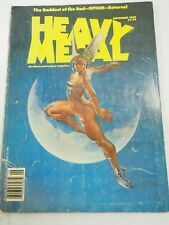 Heavy Metal Spring 1998, Sci Fi Special, Gimenez, Frezatto. Square bound magazine. Near Mint (NM) (9.0 to 9.7) Any wear to the cover is so minor as to be nearly un-noticeable. The spine is tight with no roll at all. The cover has nearly all its original gloss (if applicable). These are data disks that can be read on pc/macs/androids etc. huge collection from 1977 to 2012. these are not paper issues. plus epic illustrated collection from issue 1 to 34. Among several other stories it includes Liberatore's "Ai Shiteru". Also Enki Bilal "The Color of Air" part 2. Square-bound magazine 144-pages, colour. This is a new book. Near Mint (NM) (9.0 to 9.7) Any wear to the cover is so minor as to be nearly un-noticeable. Heavy Metal Horror Special ; AZPIRI, BILAL. New book. Colour about 124 pages magazine sized. Includes work by ROYO, AZPIRI, BILAL, and several others. This is a new book. Heavy Metal October 1982: Wrightson, Manara, Corben, Caza, Royo, Bilal. VFN-. Berni Wrightson "Freakshow", Milo Manara "The Ape", Kierkegard "Rock Opera", Bilal "The Voyage of Those Forgotten", Corben "Den 2", Caza "The Blind Flock", Royo "Color Line"and others too. Condition is very fine minus (vfn-: There is a minor printing fault down the left edge. see pic). Heavy Metal September 1984. Jeronaton Druillet, Bilal, Thorne, Schuiten. VFN. Includes among several others Bilal, Nicola Cuti, Jeronaton "The Great Passage", Druillet, Frank Thorne, Peter Kuper, and Schuiten. In general it is a nice comic. A comic, paperback, or hardcover that has been read but looked after will often be in this grading and it is in my opinion a very collectable grade. Heavy Metal Magazine #6 September 1977. .Corben, Moebius, Druillet . VFN. Includes Corben, Moebius (Major Fatal & It's A Small Universe), Druillet (AAARRRZZZ), Tardi. Great Druillet cover and Moebius back cover. Condition is very Fine (VFN). In general it is a nice comic. Liberatore, Enki Bilal, and others. In very fine minus condition (VFN-: printing fault down bottom of right edge: otherwise no defects). In general it is a nice comic. A comic, paperback, or hardcover that has been read but looked after will often be in this grading and it is in my opinion a very collectable grade. Sci Fi and Fantasy Comics for mature readers. In colour, square bound magazine. Condition very fine (VFN). In general it is a nice comic. A comic, paperback, or hardcover that has been read but looked after will often be in this grading and it is in my opinion a very collectable grade. Gallery Art of Micky Mouse, Crepax 'Persona', and more. In colour, square bound magazine. Condition is very fine (VFN). In general it is a nice comic. A comic, paperback, or hardcover that has been read but looked after will often be in this grading and it is in my opinion a very collectable grade. Heavy Metal May 1985. Manara, Burns, Corben. VFN. Heavy Metal Magazine April 1978. Corben, Moebius, Druillet. Barbarella. Still has the loose subscription flier. Near Mint (NM) (9.0 to 9.7) Any wear to the cover is so minor as to be nearly un-noticeable. The spine is tight with no roll at all. The cover has nearly all its original gloss (if applicable). Heavy Metal Magazine October 1977. Corben, Moebius x 2, McKie, Tardi. VFN. (Includes among others Corben (Den), Moebius (The Garage, and How Good Is Man), Tardi (Polonius), McKie (Jet Man), and Wrightson (great back cover). Condition is very fine (VFN).). In general it is a nice comic. Heavy Metal Magazine July1978. Barbarella, Corben, Druillet. VFN. Includes among others, Corben (Sindbad), Barbarella by Forest, Morrow (Orion), Bilal (Death of Orlaon), Voss (Heilman), Druillet (Gail). Condition is very fine (vfn: has an old price sticker). In general it is a nice comic. Condition is fine plus (FN ). Fine (FN) (5.5 to 7.4). Certainly no writing on the cover or tape repair, but there may be more stress creases and one or two minor, short creases. Corners may be rubbed a bit. Heavy Metal Magazine September1978. .Corben, Moebius, Druillet. Voss. VFN. Includes, among others, Corben (Sindbad), Bissette (Urban Renewal), Druillet (Gail), Morrow (Orion), Moebius (The Airtight Garage), Voss (Heilman). Condition is very fine (VFN: has an old price sticker). Among several other stories it includes Richard Corben's "Murky World" part 3. Also Enki Bilal "The Color of Air" part 7, and Grant Morrision's "The Savage Sword of Jesus Christ" part 2. Square-bound magazine 120-pages, colour. Among several other st0ries it includes Richard Corben's "Murky World" part 3. Also Enki Bilal "The Color of Air" part 7, and Grant Morrision's "The Savage Sword of Jesus Christ" part 2. Square-bound magazine 120-pages, colour. Heavy Metal May 1983: Manara, Crepax, Bilal. VFN. Manara 'The Ape', Crepax, M W Kaluta, Bilal, Space Crusader by Pepe Moreno, and others. Condition is very fine (VFN). In general it is a nice comic. A comic, paperback, or hardcover that has been read but looked after will often be in this grading and it is in my opinion a very collectable grade. Heavy Metal May 1982: Corben, Moebius, Druillet, Caza, Schuiten. Bilal. VFN. Moebius/Jodorowsky Incal, Corben Den2, Yragael by Druillet, Jeff Jones' I'm Age, Schuiten (At the Middle of Cymbiola), Bilal "The Voyage of Those Forgotten", Chaykin, and more! This copy is in very fine condition (vfn). Heavy Metal Magazine November1978. .Corben, Moebius, Druillet, Sire .VFN. All in all a great issue! This copy is very fine (VFN: chip at top of spine. Still has the subscription flier). In general it is a nice comic. A comic, paperback, or hardcover that has been read but looked after will often be in this grading and it is in my opinion a very collectable grade. Condition is fine minus (FN-: has a dog-ear crease and ding bottom right corner front cover (see scan). Fine (FN) (5.5 to 7.4). Certainly no writing on the cover or tape repair, but there may be more stress creases and one or two minor, short creases. ). Heavy Metal Spring 1999. "Crossroads Special". . Gimenez, Trillo. VFN. Square bound magazine in very fine condition (VFN). In general it is a nice comic. A comic, paperback, or hardcover that has been read but looked after will often be in this grading and it is in my opinion a very collectable grade. Heavy Metal 280 cover.B. . Grant Morrison. Enki Bilal. Sealed new copy. This is a new book still in its original sealed plastic envelope. Fine (FN) (5.5 to 7.4). Certainly no writing on the cover or tape repair, but there may be more stress creases and one or two minor, short creases. Heavy Metal Magazine April 1979. Corben, Moebius, Bilal, Chaykin . FN. Includes among others, Corben (Arabian Nights), Moebius (The Garage), Chaykin (Gideon Faust), Enki Bilal (Going Native). Condition is fine (FN: has a faint dog-ear crease bottom right corner. see pic. ). Heavy Metal Spring 1986. Moebius, Solano Lopez, VFN. New Quarterly format, squarebound magazine with 7 complete stories, including Moebius 'Celestial Venice' and Solano Lopez 'The Knockout'. Book is in very fine condition (vfn: it has a price sticker).